Have you ever enjoyed one of those brilliant birding expeditions, the outing where every target species takes its cue with machine precision? Of course we’ve all experienced the excruciating opposite of such an excursion, but when waves of new birds practically clamor for attention in quick succession, the feeling is exhilarating. Such was my introduction to Aripo Savannah in Trinidad. My first morning in Trinidad was dedicated to discovering the myriad wonders of Asa Wright Nature Centre. Heady stuff indeed, but by the time lunch was over, the torrent of lifers had dwindled to a mere trickle. Time to explore some new habitat! Fortunately, we weren’t far at all from a mandatory stop on any Trinidad & Tobago nature tour. 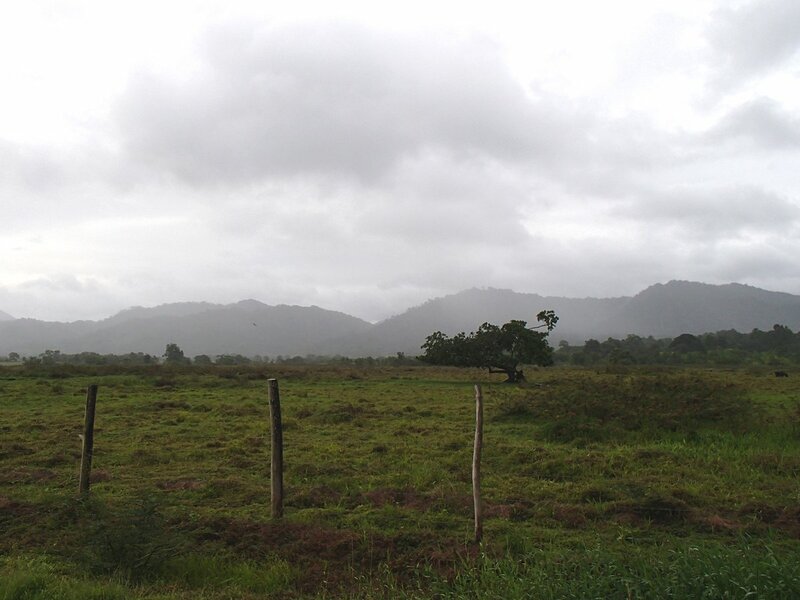 Aripo Savannah, one of the last and largest natural savannahs in Trinidad, offers rich wet prairie that is home to an array of flora and fauna found nowhere else on the island. So our large party, ably led by Mark and Larry of Caligo Ventures and local expert Mahese Ramlal and his team, assailed Aripo on our way to Matura Beach. Where we entered the area, the savannah seemed more like Aripo Ranch. In fact, it was. The lush pastures of the Aripo Livestock Station sustained herds of happy Buffalypso, a special breed of T&T beef cattle named for their Water Buffalo heritage and Calypso-happy country. 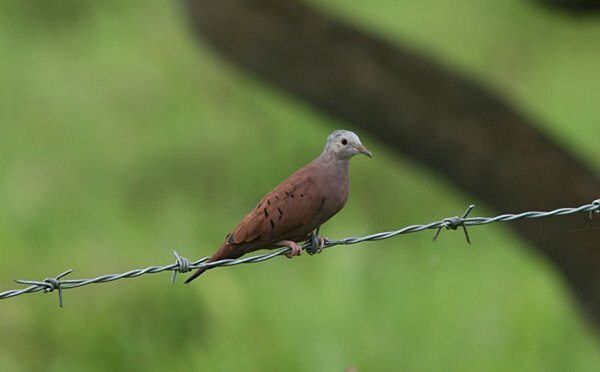 But ranches, as you may know, can offer extremely benevolent birding, especially when it comes to grassland species. In that regard, Aripo was amazing. Anis, both Smooth-billed and Greater, were evident as we entered the area. So were an abundance of waders, from the typical Cattle Egrets to more exotic but equally common Southern Lapwing to even more interesting species like Striated Heron and Wattled Jacana. Oddest of all was a winnowing Wilson’s Snipe that persistently strafed the area. Every few yards into Aripo encouraged another species to show itself. Seedeaters may have stayed out of the way, but we encountered abundant Blue-black Grassquits, Yellow-chinned Spinetails, and Fork-tailed Flycatchers. Wet grasslands are good for tyrants, so we weren’t surprised to encounter both Pied Water-Tyrant and White-headed Marsh Tyrant. Also evident were the expected Gray-breasted Martins, White-winged Swallows, and various common pigeons and doves. Once we waded through the common birds, more cherished species caught our eye. One of my favorites was a lanky Savannah Hawk. Another was a small pod of adorable Green-rumped Parrotlets, which I’ve been itching to see every since Nick Sly first wrote about Forpus passerinus on this blog. Last but not least were not one but TWO new species of blackbird for me, both Yellow-hooded and Red-breasted! We definitely missed some birds that would have been splendid to see, rarities like Fork-tailed Palm Swift, Red-bellied Macaw, and the scarcer flycatchers, tanagers, and orioles. But the birds already mentioned came out so quickly that we felt fully sated in minutes. And unlike a cheap meal at a fast food joint, this banquet of birds remained satisfying long after we left! In fact, I didn’t even think of the birds we couldn’t find anywhere else, since I was so entranced with, off all things, a grackle. 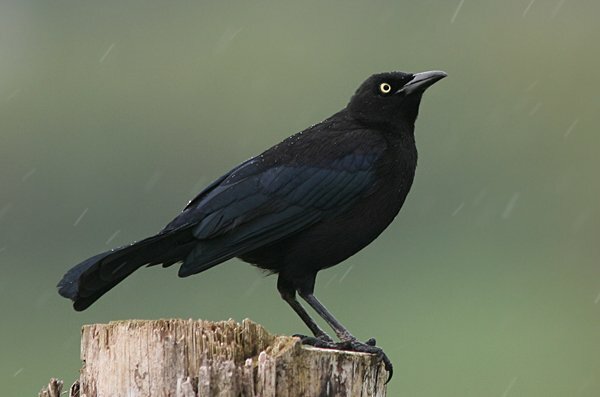 Apparently, I have a thing for these irascible icterids, which manifested in an inexplicable (to my traveling companions) interest in my first Carib Grackles. These birds are seriously stunning with deep jet and indigo plumage setting off a cold, yellow eye. Aripo Savannah served up a bounty of new birds, but the one I remember best was the one that reminded me most of home. Nice Mike. 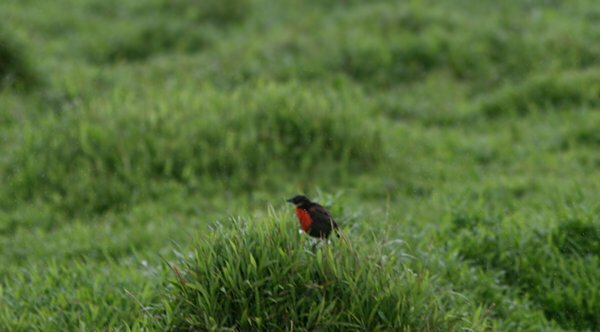 Perhaps interesting to mention that Red-breasted Blackbird is a meadowlark, rather than a typical Agelaius blackbird. The White-browed Blackbird shares this affinity with the meadowlarks too. Thanks for this post on Aripo – I hope to visit soon. Thanks, James. Yes, I love that fact about the Red-breasted Blackbird. And you will love Aripo.